On Saturday 26 September, 1,000 deaf, disabled and non-disabled marchers from all over the UK took to the streets of London to protest against the government’s cuts and caps to Access to Work funding. Jen Dodds shares what happened. 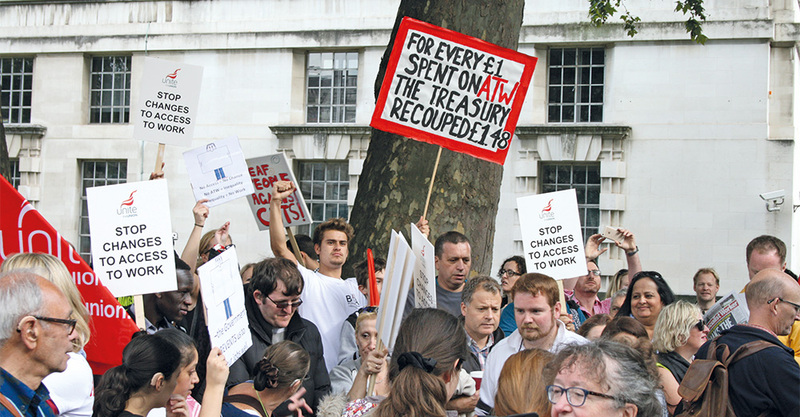 Organised by the Stop Changes to Access to Work (SC2ATW) campaign group, the loud and lively march started at Parliament Square and ended with a rally opposite number 10 Downing Street, passing the Department of Work and Pensions on the way. Joined by many different supporters, including Disabled People Against the Cuts, Unite the Union, the British Deaf Association, the National Union of Sign Language Interpreters, Deafway, Visual Language Professionals, the Socialist Workers Party, Unite the Resistance and Equity, the march made it clear that access to work is an issue that is important to everyone, not just deaf and disabled people. Indeed, everyone was talking about the value of deaf and disabled people’s contributions to society – without AtW, everyone loses out on our input. The rally was kicked off by compere John Walker, who got the crowd signing “STOP” in the direction of Downing Street after each speech. The atmopshere was electric, with lots of whistle-blowing and applause (both the clapping and hand-waving kinds)! The speakers were a mix of deaf and disabled people and allies: Jane Aitchison from Unite the Resistance, Jeff McWhinney, former Managing Director of Significan’t, Sean McGovern from the TUC Disabled Workers’ Committee Co-Chair/Unite the Union, Tracey Lazard from Inclusion London, Dawn Marshall from Becoming Visible, Ray Johnson from People First, Jen Smith from NUBSLI, Jane Cordell from Result CIC and Roger Lewis from Disabled People Against the Cuts. SC2ATW were represented by Jenny Sealey (Artistic Director of Graeae Theatre Company) and Ellen Clifford, who read out messages of support and thanked everyone for marching. Most of the speakers talked about their personal experiences of AtW, and how we must fight back against the cuts. A lot was said about working in solidarity, because we are more powerful together. We want to be able to allow our deaf and disabled children to dream about what they want to do in the future – with AtW support, they will be able to do whatever they want, but without it, their options will be limited. Jane Cordell, who lost her job at the Foreign Office because of a lack of access, asked how we can be the role models that young people need without access to work. After the speeches, it was announced that Labour party leader, Jeremy Corbyn, Shadow Chancellor John McDonnell, Teresa Pearce MP, the Green party’s Romayne Phoenix and Jonathan Bartley, actors Cherylee Houston (Coronation Street), Liz Carr (Silent Witness) and Julie Fernandez all supported the march and were sorry they had been unable to attend. o campaign until AtW returns to being a fully inclusive scheme and provides support regardless of level of need. As the #StopChanges2AtW march neared 10 Downing Street, BDA Chair, Dr Terry Riley OBE gave regular updates in BSL. BDA asked Geraldine O’Halloran co-founder of #StopChanges2AtW about the march. Jeff McWhinney, SignVideo founder, shared his concern over Access to Work at today’s #StopChanges2AtW march. John Walker revealed why the march was so important at the #StopChanges2AtW rally. 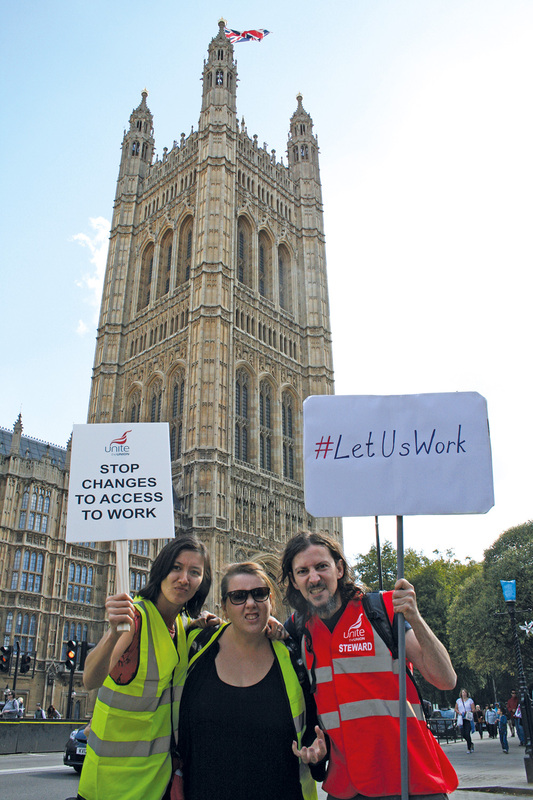 The BDA are supporting the ‘Stop Changes to Access to Work’ march because it believes the Department of Work and Pensions’ process has led to many decisions which will put Access to Work Deaf applicants and BSL users at a disadvantage. The BDA want to show solidarity with those members of the Deaf community who are being negatively and unfairly affected by these changes. From our community’s feedback, we can see that restricting support budgets, cutting hours and imposing unrealistic ceilings on interpreters’ fees are making it even more difficult for Deaf BSL users in employment. It’s of concern to us that the jobs of many Deaf BSL users, whose support needs now cannot be met, could be at risk. “We’re encouraged to see the Deputy Leader of the Labour Party, Tom Watson, campaigning against these Access to Work changes and hope other MPs will also listen to the Deaf community’s needs. The BDA is currently researching the effects of the new cap policy on any new Deaf applicants and hope the government will be open to listening to our findings,” said Dr Terry Riley OBE, Chair of the British Deaf Association.